Working out, whether that be going to the gym solo, joining in with a fitness class or doing a workout at home with a program such as Results with Lucy is all well and good, but what really gets you slimming down and toning up is what you eat. I know you’ve heard it all before, but dropping the pounds really is all about what you eat. I think I read somewhere that losing weight is 80% about the food and 20% about the exercise. Personally, I think with me there’s another 10% thrown in there for good measure on the mentality of working out in the first place, but overall, it is mostly about the food. When I was reviewing the Results with Lucy 6 week Beach Body Upgraded Plan, I made sure that I wasn’t just reviewing the exercises, but the meal plan too. Results with Lucy is a program with an all over package and not just some quick fix moves to get you in shape. If you read my previous progress posts (which you can find here) then you’ll know that I was also making a massive effort to change my eating habits along the way. I’ve never gotten on with meal plans in the past, but there was something about the RWL one that made it so much easier to follow. Before starting the Beach Body Upgraded Plan I ate terribly. I always tried my best to eat healthy but as a rather fussy and (slightly) lazy person it always seemed easier to just chuck in some chips and a chicken kiev than it was to stand and cook a proper (more nutritious) meal. I think it was the mindset I’d had since living with my parents. My mum always cooked easy meals as she hated being in the kitchen and so I just ate the basics, those being mostly baked beans and pasta. When I first met Jordan it took him a while to get me out of constantly making pasta, for a guy who hated the stuff and liked cooking new things it was a perfect match as it got me out of my comfort zone. Thanks to him encouraging me to try new things, some of my favourite meals now are ones that I hadn’t even tried before just over a year ago (stir fry I’m looking at you here). So when I took a look at the RWL Meal Plan I was a little daunted, I wasn’t used to eating so healthy and so decided to start myself slowly and not rush into cutting out everything I liked completely. Instead of sticking to the exact plan that the Beach Body plan suggested I decided to move it around. With me promising to cook most nights, Jordan didn’t mind what we ate (as long as it had meat in – he’s such a boy!) which made it so much easier to stick to as I was cooking for the both of us. If there was an evening meal suggestion that I wasn’t to keen on, I tended to take a search through the rest of the recipe’s on the website and choose something similar to make instead. It meant that I wasn’t getting bored with the plan, wasn’t hating eating things I didn’t really like and meant I was still eating healthy meals. I loved it and found it so much easier to stick to. Below I’ve listed some of my favourite meals from the RWL Meal Plan site – If you’re a member then make sure you head over to check out the recipes and make them yourself and if you’re not then what are you waiting for?! I was never a massive breakfast eater before, but it is the most important meal of the day after all! Since eating breakfast every day I’ve definitely seen a massive drop in the amount of food I crave throughout the rest of the day. I am in the fortunate position at the moment where I can go home for lunch. This means that I can often quickly cook a meal for myself fresh, which is most definitely what I prefer. However, there are plenty of meals on the RWL Eat Well section which are perfect for cooking in bulk and prepping for the week. The one that I look forward to most each day! I love to eat big meals in the evening and cutting down my portion sizes has been tougher than probably anything else I’ve had to cut down, but with the meals being better for me (higher in protein, lower in fat etc) I’ve still been full! Balsamic Glazed Steak with Sweet Potato Mash! Results With Lucy have also currently got a competition running to win a holiday for two to Antigua! 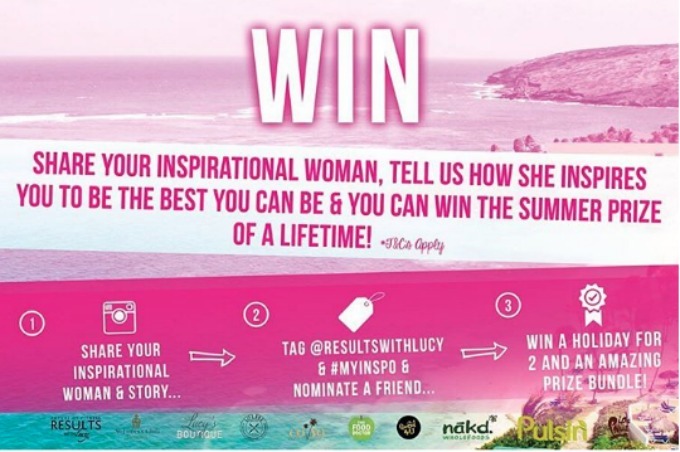 So make sure you check out the information below and get hash tagging #myinspo for a chance to win by sharing your inspirational woman on Instagram! What are your favourite healthy meals to make? Do you have a plan you stick to? Let me know in the comments below!